This passage follows immediately upon Vasari’s description of the Gallery of Francis I and describes the only other work of decoration by Rosso in France of which he gives an extensive account. The room that Rosso decorated was identified by Dimier as the Salle Haute on the second or top floor of the destroyed Pavillon des Poêles at Fontainebleau.2 The construction of this pavilion was probably begun around 1537, very possibly under Rosso’s direction and from his designs (see L.42). The length and breadth of the interior of the Salle Haute were approximately 19.3 by 8.8 meters; it was probably about 6 meters high.3 It had arcades on the west, south, and east sides, and hence, as Vasari said, the “forma di padiglione.” On the short east and west sides there were three arches, on the long south side, five. The arches appear entirely open in Du Cerceau’s views and in the Barberini tapestry cartoon (Fig.Du Cerceau Print, Gallery; Fig.Du Cerceau, Basse Cour, East Front; Fig.Du Cerceau Print, Cour de la Fontaine and Fig.Barberini Tapestry Cartoon reversed), giving the top floor of the pavilion the aspect of a belvedere, but they were actually fitted with casement windows, which are mentioned in the specifications for the woodwork of this room (see below). Above the arches, piers, and spandrels on three sides of the room there would have been a continuous band of wall. There would also have been a continuous area of wall, probably about a meter high, enclosing the room beneath the arches and the casement windows. 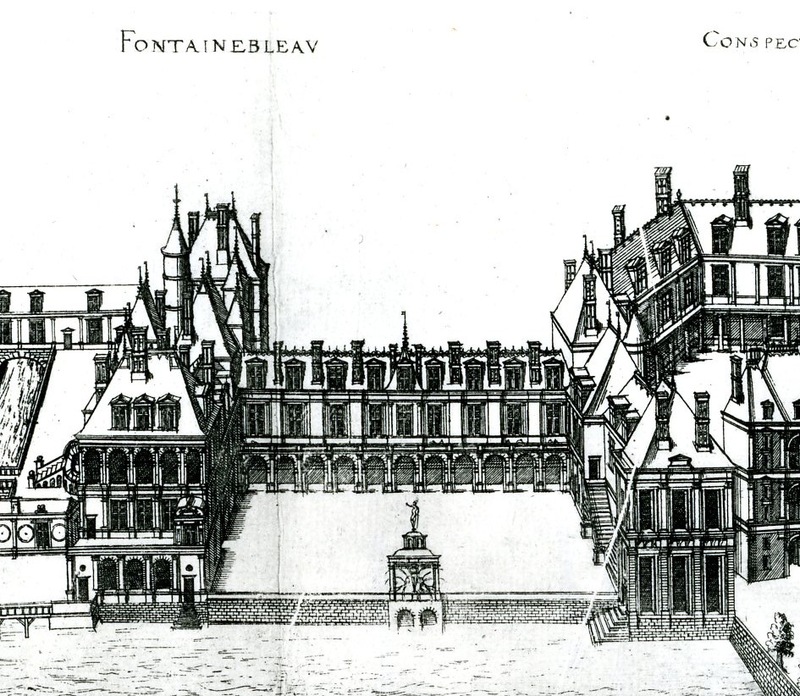 The north side would probably have had a blind arcade and a doorway in the second bay from the west end leading to the stairway in the exterior tower (a rectangular window at the far east visible in Du Cerceau’s view of the Cour de la Fontaine [Fig.Du Cerceau Print, Cour de la Fontaine] may be a later addition). The ceiling would have been flat; although it is likely that it had wood beams and probably coffering, there are no records that pertain to it and to its appearance. In considering how this room was decorated, account has to be taken not only of Vasari’s description but also of the few pertinent remarks about it made by Dan in the seventeenth century.4 Dan saw the second floor of the Pavillon des Poêles only after it had been divided into two rooms and decorated anew around 1577.5 But something of its original decoration survived. Dan wrote that the two rooms were “enrichies et ornées de figures de relief de stuc, lesquelles sont au dessous du platfond, et entre lesquelles se voyent les Chiffres et les Devises de François I. de Charles IV. de Henry le Grand, et de la Duchess de Beaufort: ce qui fait juger que ces ornements ont esté commencez par les Roys François, et Charles, et continuez et achevez par le feu Roy. The major decoration that Dan subsequently described is twenty-seven paintings of scenes of the Life of Hercules that were divided between the two rooms. Some of these paintings would probably have replaced a part of the decoration of the original single room. From Vasari, from Dan, and from the record of the agreement made with Scibec for the woodwork of the room (see below), the general scheme of the decoration of the Salle Haute done during the reign of Francis I can be envisioned. The lower part of all four sides, including the embrasures of the doorways and casement windows up to the lower level of the fresco and stucco decoration, was covered with sunken panels of wainscoting in walnut decorated in low relief with the arms and devices of the king, which included salamanders. On the east, west, and south sides each section of wainscoting had a bench supported by two legs in the form of balusters. Alongside and between the doors were benches. This arrangement would have been similar to that in the Gallery of Francis I. Immediately beneath the ceiling and above the arches was a stucco frieze and between it and the wainscoting the frescoed seated gods and goddesses evenly spaced around the room and surrounded by stucco ornament in high relief of figures, putti, garlands, and animals. Included in the decoration were emblems of Francis I. The seated figures would have been painted on the walls between the windows, one on each pier. The two wall surfaces of each corner pier were smaller and may, therefore, have received other decoration. Because Vasari makes a special point of the large number of seated gods and goddesses that were painted in this room, it is reasonable to assume that they were also depicted on the piers of the blind arcade of the north wall. If this was the case one can calculate that there were twelve seated figures, not counting the angled piers in the corners, or twenty if the four corner piers had two figures, one on each face. No evidence indicates what might have filled the five arched wall areas of the north wall. 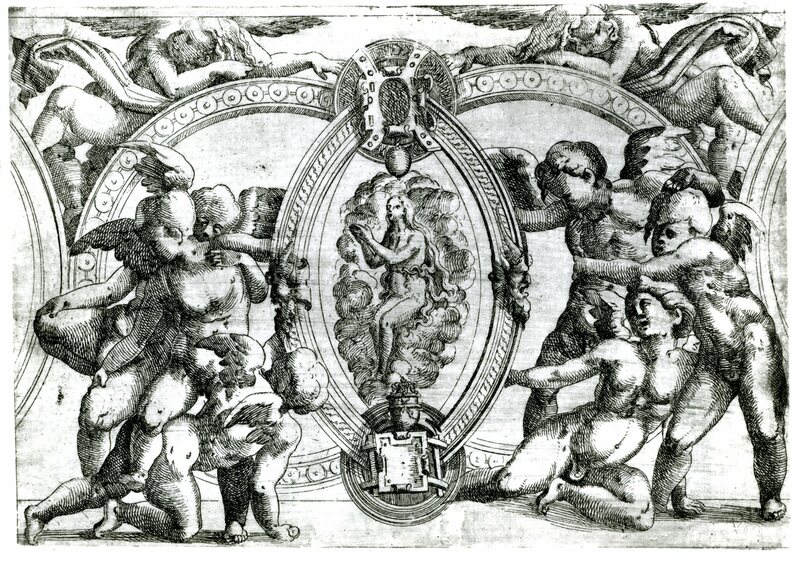 Three of the seated gods and goddesses planned by Rosso are known. 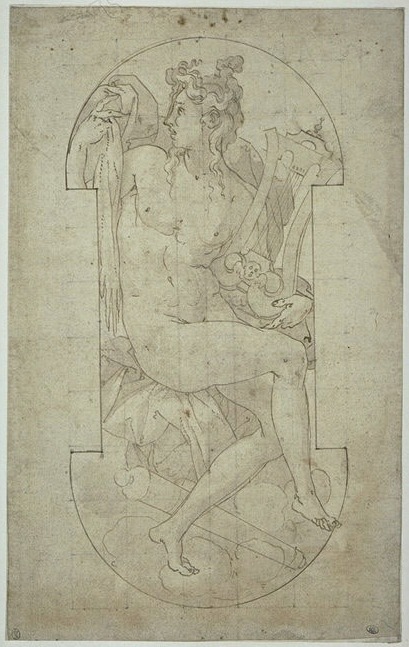 Apollo is known from a drawing by Rosso in the Louvre (Fig.D.76Aa), from an anonymous engraving derived from it (Fig.E.151), and from an etching possibly by Du Cerceau based on a lost drawing (Fig.E.60). 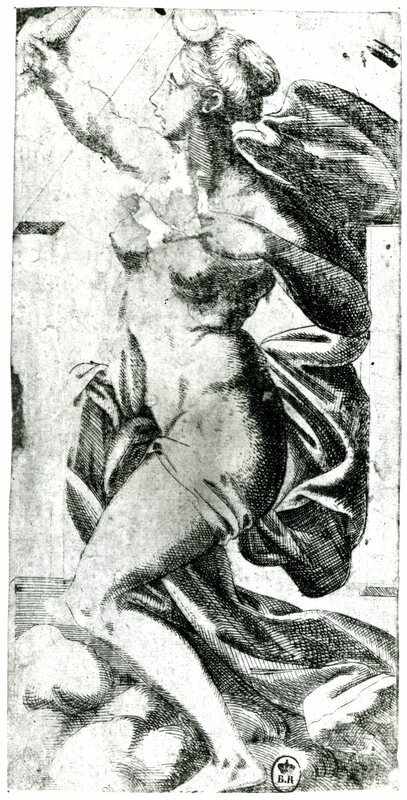 Venus is seen in an anonymous etching (Fig.E.152) and Diana in another etching attributed to Du Cerceau (Fig.E.61), both most likely derived from lost drawings by Rosso. All the figures are placed in a vertical format that corresponds to what the shape of the piers of the Salle Haute would have been. In the drawing and the etchings the sides of the vertical area in which the figures are placed are indented in the same rectangular manner, indicating that the images were made for the same project. In the Apollo drawing the top and bottom of the area containing the figure are arched, while in the etchings the tops and bottoms are rectangular. 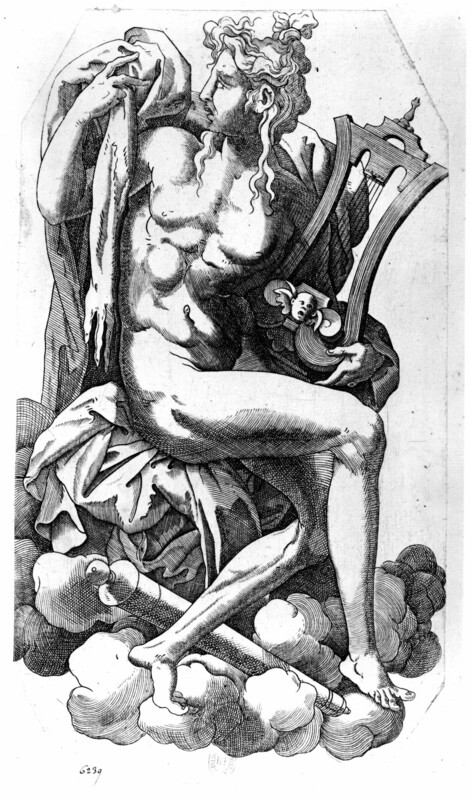 Because the etched Apollo appears to show a later version of this figure, it seems probable that the figures executed in the Salle Haute were in areas squared above and below. 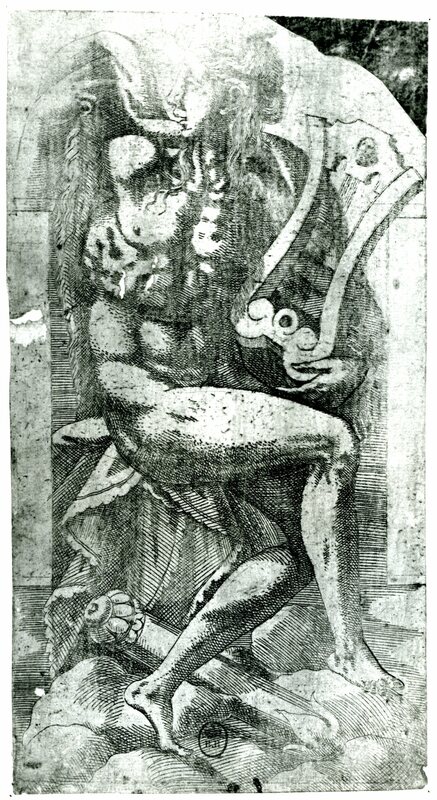 (The flayed arm and hand of Marsyas that appear in the Louvre drawing and the engraving have been changed into a furry tail or plume in the etching, probably because the etcher did not understand what was described in Rosso’s lost drawing). It is not possible to tell from the drawing or the prints how large the frescoed figures were intended to be. But given the height of the piers in this room – about 3.5 meters – one might suppose that the figures were at least life-size. The etchings of Diana and Apollo show by perspective rendering at the sides that the figures were to be painted on raised slabs, or to have this appearance. 1 For a discussion of the “no” that appears in this passage, see Vasari-Bettarini-Barocchi, IV, 1976, 687-688. 2 Dimier, 1898, 112-121, and Dimier, 1900, 52, 71, 319, 390; see also Dimier, 1904, 81-83; Dimier, 1925, 42-43; Dimier, 1928, 8; Kusenberg, 1931, 103-104, 202, ns. 244-248; Dimier, 1942, 24; Barocchi, 1950, 252; and Claude Lauriol, in EdF, 1972, 482, and in Fontainebleau, 1973, II, 154-155; Carroll, 1987, 11, 31, 330-335, under no. 104. 3 On the measurements of the plan, see L.42. 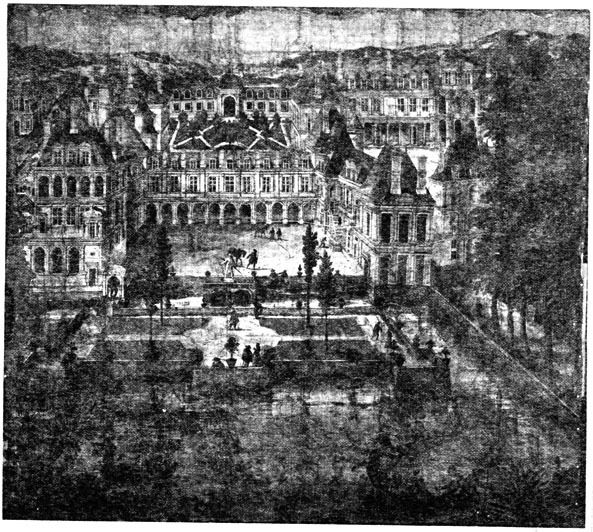 From these the height can be calculated from Du Cerceau’s view from the Cour de la Fontaine (Fig.Du Cerceau Print, Cour de la Fontaine). 5 See L.42; on the lost paintings by Toussaint Dubreuil and Ruggiero de Ruggieri, see Dan, 1642, 129-131; Dimier, 1898, 114; Dimier, 1900, 319; Herbet, 1937, 126; Béguin, 1964, 89-93; and Claude Lauriol, in EdF, 1972, 482, and in Fontainebleau, 1973, 154-155. 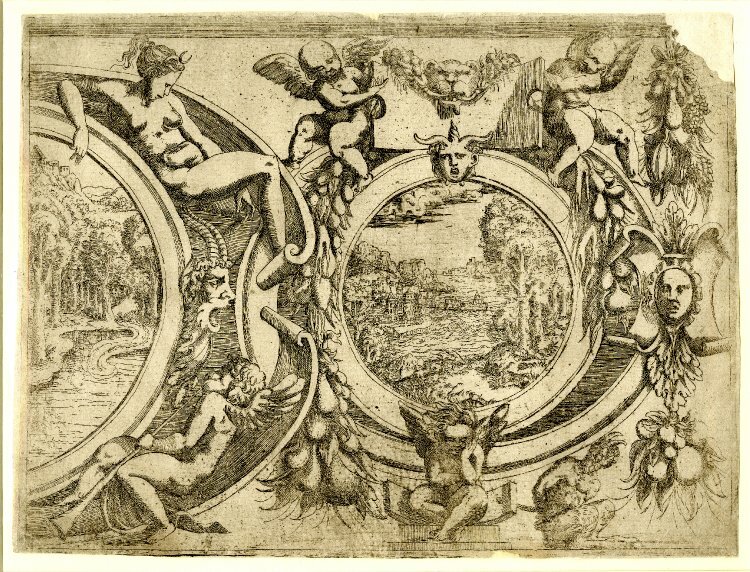 6 There is only one print clearly indicating a frieze that could be by Rosso, an anonymous etching framing a small scene of the Assumption of the Magdalen (Fig.E.159). But if the central subject of this etching is part of its original conception then it could not have been conceived for the Salle Haute. Stylistically it is not closely related to the Apollo, Diana, and Venus that Rosso designed for this room. 7 Vasari mentions the Salle Haute immediately after stating that the king gave Rosso a “canonicato nella Santa Capella della Madonna di Parigi.” If this refers to his canonicate at Notre Dame, which he received on 26 December 1537, rather than to the canonicate at Sainte Chapelle that is reported to have been obtained in 1532, then this placement might give further support to the dating of the design of the decoration of this room in these years. 8 Dimier, 1898, 113, and 1900, 52, cited a record of payments from the period 1538-1540 that would indicate that work was being done in the Pavillon des Poêles before Rosso’s death and quite likely under his direction. But the only room mentioned is the “grande salle” on the first floor (see L.45). Dimier, wrongly, I believe, thought this referred to the Salle Haute. 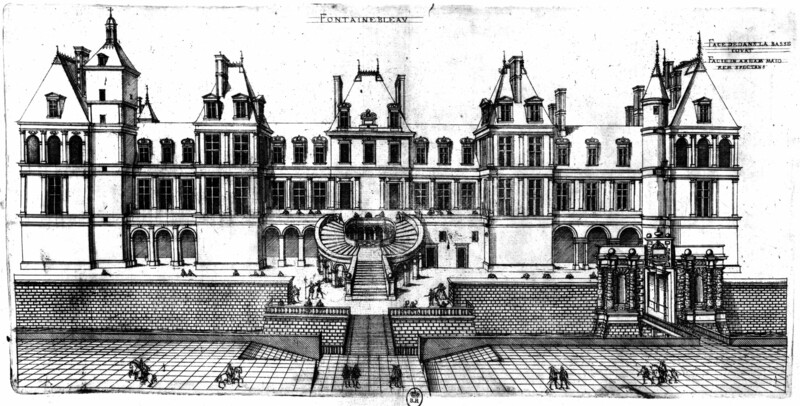 9 Paris, National Archives, where it should be among the papers of J. Trouvé, XIX, 154-157. February 25, 1542 (modern style). Fut présent Francisque Scibecq, dit de Carpy, menuysier italien dem. à Paris, lequel recongnut et confessa et par ces présentes confesse avoir faict convenance et marché avec Messire Nicolas de Neufville, chevalier, sgr de Villeroy, conseiller du Roy, n.s., et secrétaire de ses Finances, et à Philbert Babou, aussi chevalier, sgr de la Bourdaizière, conseiller dud. sgr. secrétaire de ses Finances et trésorier de France, commissaires ordonnez et députez par led. 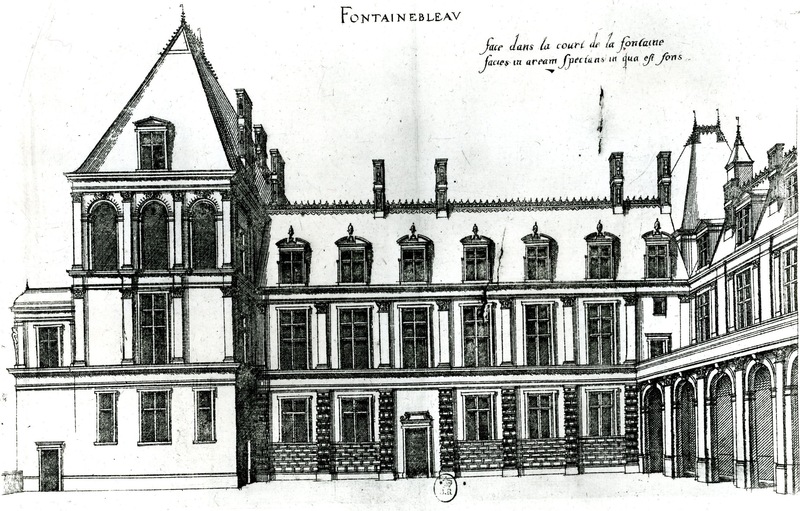 sgr sur le faict de ses bastimens et édiffices de Fontainebleau, de faire pour le Roy en la salle par hault du grant pavillon du costé de l’estang de son chasteau de Fontainebleau les ouvraiges de lambruys de menuyserie qu’il convient faire de neuf contre les murs en quatre sens au pourtour de lad. salle du long et lé d’icelle et dedans les embrasemens des murs à l’endoict des croisées et huisseries depuis le rez de [blank] du plancher de lad. salle jusques à la haulteur des ouvraiges de painture et stucq qui sont faictz en icelle salle, lesquelz lambruys seront garniz de dossiers enfoncez, et entre une croisée à l’aultre tant sur les deux boutz de la salle que sur le devant faire un doulcin de lambruys garny d’un grant penneau au meillieu portant moulleures tout au pourtour enrichies de taille antique à demi bosse avec armoiries et divises du Roy et à l’endroit et chacun desd. penneaulx faire et ériger ung siège de la longueur d’icelluy de telle saillye et haulteur qu’il apartiendra aussi portant mouslures tout à l’entour, porté et soustenu à deux piedz tournez en façon de balustre, et du costé des huisseries faire deux grands pans de lambruys de menuyserie portans mousleures et enrichissemens comme les autres, et à l’endroit de chacun d’iceulx faire et ériger une siège de la longueur du pan qui sera de saillye et haulteur telle que dessus, aussi faire les huisseries de boys de noyer des façon antique et enrichissements susd., et entre lesd. huisseries faire ung petit pan de menuyserie garny de siège de la longueur qu’il apartiendra et de la façon que les aultres. Plus faire le planchement d’assemblaige de menuyserie du parterre sur le plancher de lad. salle de la longeur et largeur d’icelle, et dedans les embrasemens et espoisseur desd. murs, de beau et bon boys de chesne à lorenges et carrez faicts et assemblez en lassures, portans filletz ou nerveures de boys de noyer pour courvrir les chevilles desd. assemblaiges, qui sera assis sur lambourdes de charpenterie qui pour ce faire seront faictes par les maistres charpentiers du Roy aux despens dud sgr. [follows a description of the woodwork for the Galerie Basse, for which, see L.44]…et tous lesd. ouvraiges faire et parfaire, assembler et asseoir bien et deument comme il apartient selon les patrons et devises pour ce faictz a dit de menuysiers experts et gens à ce congnoissans en la plus grande et extrème dilligence et au plus grand nombre d’ouvriers que faire se pourra… et par led. Francisque fournir, querir et livrer à ses despens tout le boys de noyer qu’il conviendra pour ce, faire cheriages…, peine d’ouvriers…, et ce moyennant et parmy la somme de trois mil livres t. pour tous lesd. ourvraiges…,. prom., obl., ren. Fait passé double l’an mil Vc quarente et ung le samedy vingt cinquiesme jour de février. 10 Paris, Bibliothèque Nationale, ms. fr. 11.179, fol. 178-179. January 1, 1541 (modern style) – September 30, 1550. A Claude Badouyn, Lucas Romain, Charles Carmoy, Francisque Cachenemis [above, in a later hand: Caccianemici], et Jean Baptiste Baignequeval, paintres, pour avoir par eux vacqué tant aux patrons le la tapisserie que le Roy fait faire audit Fontainebleau que aux ouvrages de paintures de ladit salle haulte du grand pavillon près l’estang, et audit pavillon estant au coing du clos dudit estang, à raison de 20 liv. à chacun d’eux par mois de l’ordonnance desdits commissaires. Paris, Bibliothèque Nationale, ms. fr. 11.179, fol. 182. January 1, 1541 (modern style) – September 30, 1550. Aux paintres et imagers cy dessus nommez, pour ouvrages de painture qui ont vacqué et faits tant en la salle haulte dudit grand pavillion, près l’estang, que aux tableaux pour le cabinet du Roy et en la chambre de madame D’Estampes, au pris susdit. The list of names “dessus nommez” is entirely different from that of the other list of payments. Laborde, I, 1877, 201, with list on 200. 11 Herbet, 1937, 126, thought Dimier was mistaken in attributing the decoration of this room to Rosso and preferred instead to attribute it to Primaticcio with the execution by his assistants who are mentioned in the documents. But Herbet does not discuss all the evidence and makes no reference to Vasari’s description. 12 Paris, Bibliothèque Nationale, ms. fr. 11.179, fol. 172-172v. January 1, 1541 (modern style) – September 30, 1550. A Francisque Sibecq, dit de Carpy, menuisier italien, la somme de 12,991 liv. 6s. 7d., à luy ordonnée par messieurs Nicolas de Neufville, chevalier, seigneur de Villeroy, et Philbert Babou, aussy chevalier, seigneur de la Bourdaizière, conseillers du Roy et commissaires, par ledit Seigneur ordonnez et depputez sur le fait de ses bastimens et édiffices de Fontainebleau, mandent au présent commis m[aistr]e Nicolas Picart, notaire et secrétaire de Roy, et par luy commis à tenir le compte et faire le payement de ses bastimens et édiffices, luy payer et bailler comptant des deniers de sadite commission, pour les ouvrages de lambris, de menuiserie, qu’il a faits de neuf pour le Roy, tant en la grand salle haulte du grand pavillon près l’estang en sondit cha[stea]u, au pourtour des murs sur l’aire du plancher du longs de ladite salle, que aussy au pourtour des murs de la gallerie, basse voulte, et couverte en terrasse estant contre ledit grand pavillon sur ledit estang, le tout de bois de noyer et chesne, façon et ordonnance qu’il a esté advisé par le Roy, ainsi qu’il est plus à plain contenu et déclaré au marché, de ce par lesdits commissaires, fait et passé cy devant avec ledit Francisque Scibecq, le 25e febvrier 1541 [old style], attaché ausdites lettres d’ordonnance, ainsy qu’il est apparu ausdits commissaires, et appert par certiffication de Michel Bourdin et Joachin [172v] Raoulland, menuisiers de ses bastimens et édiffices, signée de leurs mains, et de m[aistr]e Pierre Deshostles, varlet de chambre ordinaire du Roy, et par luy commis au controlle de sesdits bastimens, qui ont veu et visité de l’ordonnance desdits commissaires, et de m[aistr]e Pierre Deshotels, controlleur desdits bastimens, lesdits ouvrages de lambris, menuiserie et autres, lesquels ils ont trouvé bien et deuement faits, ainsy qu’il appartient audit cha[stea]u de Fontainebleau. Laborde, I, 1877, 186-187, transcribed, and partially transcribed in Laborde, Renaissance, I, 1850, 412. See also Herbet, 1937, 125-126.